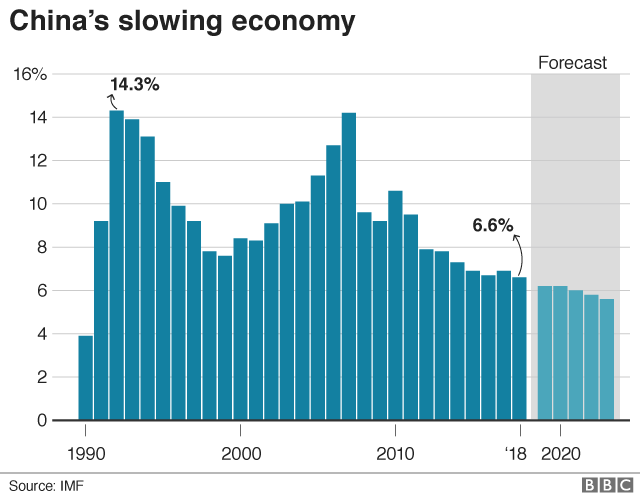 The Chinese economy has grown at its slowest rate in 28 years. 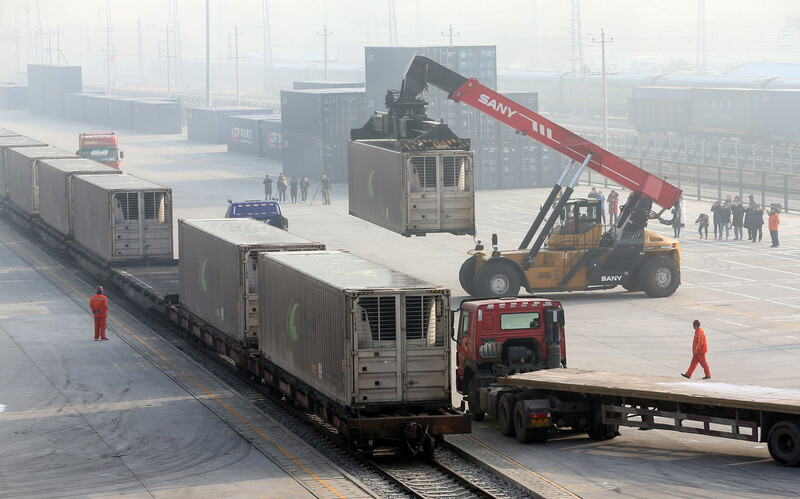 Workers unload containers from a train at Dahongmen Railway Station in Beijing, China January 14, 2019. Asian markets kept their nerve while China's stock market held steady after the data. The Austalian dollar AUD=D4, seen as a liquid proxy for China demand, also held largely steady. “There are three key drivers of the Chinese economy: infrastructure, property and exports. We see that infrastructure is rebounding, but property and exports are slowing down. “The latest data suggest that economic growth remained weak at the end of 2018 but held up better than many feared, in part thanks to a policy-driven recovery in infrastructure spending. Still, with the headwinds from cooling global growth and the lagged impact of slower credit growth set to intensify in the coming months, China’s economy is likely to weaken further before growth stabilizes in the second half of the year on the back of expanded policy stimulus. “There was no surprise from the GDP data but the basic message is that the Chinese economy is still slowing down. “The renminbi appears to have stabilized. It shows that the investors do not seem to have a big concern in the near-term outlook of the Chinese economy (and are) probably expecting some positive impact from policy measures. “Today’s retail sales are slightly higher than expected. We hope the uptrend should be sustained, but we don’t know what will happen to consumer sentiment in China. It probably depends on the result of the U.S.-China negotiation on trade. We hope the negotiation should end up with some more positive impact on sentiment. “Today’s industrial production is a slightly positive number but the manufacturing sector still appears to have a downside risk in the first quarter. “The Chinese government’s announcement...that is, to focus on stimulating the economy, appears to be focusing on the tax cut to stimulate the consumption. “It takes time (to take effect) compared to previous measures that were taken in the form of the increase in more direct spending on infrastructure. “China’s GDP headline was within expectation. But its industrial production was unexpectedly firm, which was probably due to infrastructure investments. “The Chinese economy lacks momentum. Impact from U.S.-China trade tensions are appearing and its adverse impact will continue. In addition to that, uncertainties over the global economy are increasing. “The GDP data was on expected lines...main drag was from the external side. “We expect further stimulus from the fiscal side in 2019...focus would continue to remain on reducing the tax burden and easing conditions for SMEs. “The domestic labor market remains stable...this will likely support domestic demand and consumption going forward. “One positive factor in terms of the outlook for the yuan and the equities market looking at 2019 is that the Chinese government is now taking a lot of stimulus measures to support growth. The reserve requirement ratio cuts have already been implemented and more will follow, and a ramping up of public expenditure on infrastructure and the impact of tax cuts will also help the economy. “The data shows the economy is steadily slowing down, although we had thought we could have seen a bigger slowdown. “The government has means to support the economy. They can expand infrastructure spending and they can cut banks’ reserve requirement ratio. So we don’t need to worry about capital spending. “The data continues to reflect a slowdown in China that is caused by both domestic and external weakness. Some positives to take away are that IP and retail sales beat expectations in December. That highlights some degree of resilience in the economy and shows that some of the targeted stimulus measures are helping a little to support the economy. “No real surprises there. The GDP number is down a little bit but that has been expected. It’s consistent with the commentary around a slowdown in Chinese growth. “The IP and retail data point to some stabilization in growth towards the end of last year. Overall they are not bad numbers although there will be some debate about how reliable these numbers are. “We are expecting a slowdown in Q1 led by exports, although for the year as a whole we are seeing 6.2 percent. “The headline on its own is not much of a surprise for markets. If you look at some of the positive spin for this data – the December IP and retail sales – came in better than expected. If we look at the breakdown of the commodity output, they seem to have grown at or above average levels for December. That may help remove or reduce some of the concerns of a growth slowdown becoming more entrenched this year. “The unemployment number in the data has edged up and we should not ignore that. That number edging up is not good. An escalating trade war between Beijing and Washington has heaped more pressure on China’s already cooling economy, adding to fears of slower global growth and weaker corporate profits this year. Washington and Beijing have agreed to a 90-day truce in a trade war that has disrupted the flow of hundreds of billions of dollars of goods. If solid progress towards a deal is not reached by a deadline of early March, Washington has threatened to sharply hike tariffs on Chinese goods. But a comprehensive agreement to end the dispute is seen as unlikely by the negotiating deadline, given the number of highly divisive and politically sensitive issues on the table. Even if a durable trade deal is reached dismantling current tariffs, analysts say it would be no panacea for China’s ailing economy, which is being weighed down by weak investment and faltering consumer confidence. Beijing has been stepping up policy support to avert a sharper slowdown but top officials have vowed not to resort to massive stimulus as in the past, which left a mountain of debt. The People’s Bank of China (PBOC) has cut banks’ reserve requirement ratio (RRR) five times in a year, with further reductions expected. It has also been guiding market interest rates lower but a cut in benchmark rates may not happen soon. The government is putting a greater emphasis on fiscal policy measures to cushion the downturn, with deeper tax cuts and more infrastructure spending expected this year. Corporate sales and profits are weakening, discouraging fresh investment and raising the risk of higher job losses. While some economists say China may be facing a significant slowdown, no one is expecting a crash at this point. Still, policy support measures will take some time to kick in, and the world’s second-largest economy is not expected to convincingly stabilize until summer.